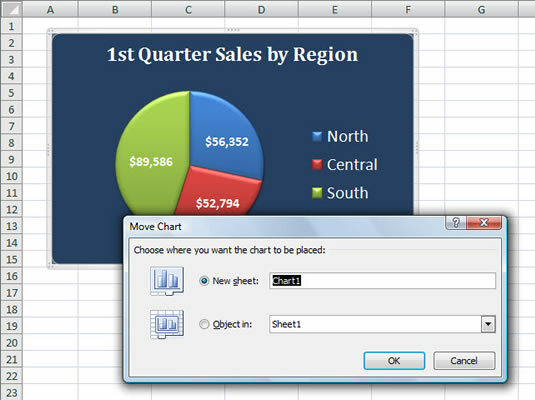 Excel 2007 automatically embeds new charts on the same worksheet as the source data, but you may find it easier to work with a chart if you move the chart to its own chart sheet in the workbook. 1Click the Move Chart button on the Chart Tools Design tab to open the Move Chart dialog box. If you don’t see the Chart Tools Design tab, click the chart to select it and make this tab appear. 2Click the New Sheet option button in the Move Chart dialog box. This option places the chart on a new chart sheet that is added to the current workbook. 3(Optional) Rename the Chart1 sheet name in the text box by entering a more descriptive name. This step is especially useful if you plan to have multiple chart sheets in the workbook. 4Click OK to close the Move Chart dialog box. The chart appears in its own chart sheet with the name displayed on the sheet tab.